Tanjung Benoa is a fisherman village formed from the delta of white sand and flanked by the sea in the both side. The government of Bali has established Tanjung Benoa beach as marine sport centre because is blessed by thebeatifull white sandy beach with calm seawater. The palm and tropical trees are able to create the sandy atmosphere including the calm seawater those are ideally for swimming, relaxation and walking on the beach. Water sport activities at Tanjung Benoa such as Jet ski, parasalling, Seawalker, flying fish, banana boat, Rolling donut and Turtle Island tour. Garuda Wisnu Kencana is a Cultural Park covering approximation 60 ha located in Ungasan. Its devoted to the Hindu Gos Vishnu, and his mount Garuda, the mythical bird who become his companion. Bali Garuda Wisnu Kencana is a statue for symbol mission of saving the environment and the world also Garuda Wisnu Kencana as icon of Bali Island. There are supporting facilities that you can enjoy like Lotus pond, Amphitheater, Street Theater, Exibition hall, and Jendela Bali. There are many cultural performaces every day at GWK. Pandawa beach is known as a secret beach due location of the beach is difficult to accsess. Pandawa beaches is greataddition to Bali’s collection of gorgeus beaches. Hidden behind large carved limestone cliff that reveal wide views to the Indian Ocean, Pandawa beaches was once also dubbed as ‘Secret Beach’. Pandawa beach is also best known for its impressive terrain and manmade limestone features that serve as a one of a kind welcome into this coastal area. Huge cliff were cut through to make way for its winding and smooth asphalt road which lead down to the beach. The sides remained as high walls, while the ocean facing cliff midway down slope feature deeply carved arches installed with large statues. They each depict the Hero character from Mahabrata epic, as Pandawa hence the name of the beach. There are six white stone statues draped in colourfull Balinese waistcloth, namely Dewi Kunti, Yudistira, Bima Arjuna, Nakula and Sahadewa. Dreamland beach was once spotted and found by some western surfers back in 70’s. They are the ones who love to discover the hidden beauty of the island, to find great surfing spots. One of the most beatifull beaches on the island, it is also renowned for its dangerous shorebreak. 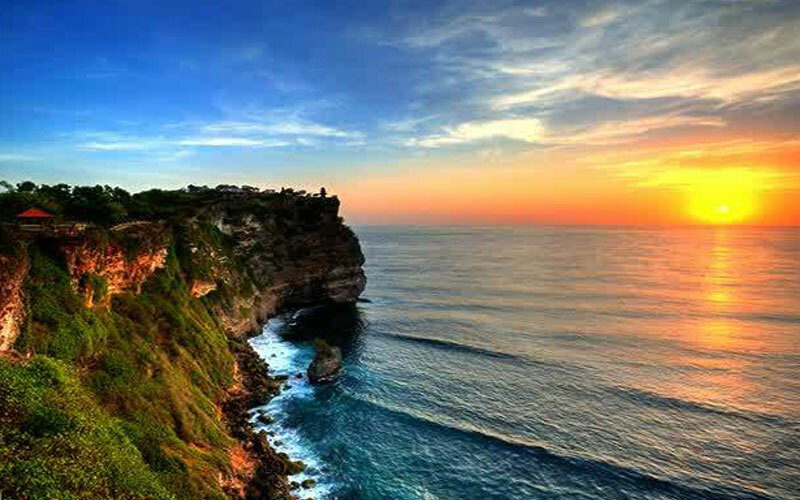 Uluwatu temple is located in south western tip peninsula, up to the blue sea cliff approximately 100 meters high, the best place to view of the sunset. Kecak dance at uluwatu temple everyday performace. The kecak dance consist of about fifty men wearing only a loin cloth, the upper part of their bodies left bare. They form rows circles, in the middle of which is coconut oil lamp. The kecak dance is performed for dance drama and the story presented is take from Ramayana epic. Jimbaran located in south of airport, the beach has white sand. The area originally fishing village with fish market. Jimbaran bay well known with beachside seafood restaurant while enjoying the sunset and scenery with cold drink and a fresh grill fish and other seafood. The seafood cost by weight. Krishna is a big and cheap fixed price souvenir store in Bali. They have all completed Balinese Souvenir, like Balinese Painting, Batik, Balinese T-shirt, Keychain, all Herbal Beauty product made of Bali and many others Balinese souvenir are available there.